I like a big screen – what can I say. While I have long enough fingers to one-hand these phones, they’re great for anyone to use two-handed. We’re doing more and more with our phones, and having a lot of screen space to work with can make a big difference. The 7 Plus has a 5.5″ screen, once considered gigantic for a smartphone. It’s great for reading content at arm’s length, so you don’t need to hunch over your phone. The aspect ratio perfectly matches most video content for viewing in landscape. The XS Max ups the giant screen game to a 6.5″ display. It spans edge to edge, so there’s very little wasted space on the surface of the phone. Top to bottom, you see a lot more content. This is great for social media and any other app that has you scrolling top to bottom. With video content, the 6.5″ screen doesn’t actually offer much over the 5.5″ when viewed in landscape. This is due to the narrower screen adding black bars to the sides of content to avoid anything getting cut off. Nonetheless, video displays much bigger than on the non-Plus or Max models. Size isn’t the only thing to consider with the display. While the Plus’s screen is sharp and bright, it’s an LCD – not OLED like the XS Max. The OLED screen gets you truly deep blacks, and super vivid HDR colors. It’s really an impressive difference, especially when viewing photos and video. I personally consider it the #1 improvement between these phones. Not to be ignored are the extra pixels on the Max. The resolution is 2688×1242 for a pixel density of 458ppi, while the Plus sits at 1920×1080 and 401ppi. Great if you’re playing back 4K video or doing a lot of photo editing and viewing. True Tone is another feature which was added in between these models. It uses sensors to check the lighting around you and adjust the color of the display accordingly. The result is colors that look more true to life. Finally, the Max’s screen is a bit more responsive to touch. It registers the touch of your finger at 120hz instead of 60hz, which makes it feel snappier. If you’re all about the screen, the XS Max definitely deserves consideration. It’s been a while since we’ve seen any improvement to battery life on the biggest phones Apple offers. Sure, it’s great that they can add new features and maintain the same battery life. But it’s always nice to have more battery life to work with. With the XS Max, they’ve been able to add about 1.5 hours of extra usage, which is pretty significant. If charging in the middle of the day is no big deal or you just don’t use your phone a lot, you may not see your battery drop below 20% as it is. If you’re barely getting through your day without seeing the meter hit the red, it’s a welcome improvement. Speaking of the battery, wireless charging was added to the lineup in between the release of these models. If you’re often at a desk or in the car, wireless charging is pretty convenient. Pick up an inexpensive charger and you can top off the XS Max’s battery any time you set it down. Phone cameras have really become awesome. I find my DSLR gathering dust on the shelf as the iPhone’s camera improves. We’re able to capture so many more great moments now that our camera phones are far beyond the blurry mess they once were. The 7 Plus was the first iPhone to offer dual cameras – one wide angle, one telephoto. Portrait mode was another cool addition, which adds a bokeh effect to blur backgrounds and make the subject stand out. Since then there have been some changes – how significant the improvements are depend on just how much you use the camera. The wide angle lenses on both models have a f/1.8 aperture and optical image stabilization (OIS). However, the image sensor for the wide angle lens has increased in size on the Max to let in more light. The telephoto lenses are different, with the Max improving from f/2.8 to f/2.4 and adding OIS on this lens. This translates to better low-light performance. A lot can be improved behind the scenes with software. New to the XS models is Smart HDR, which automatically takes multiple frames and combines them to help bring out detail in shadows. The Depth Control feature gives you a slider to adjust the background blur on photos you’ve already taken. The extra CPU power of the XS models works to improve face detection, red eye reduction, and the speed it takes to pull up the camera to take a shot. Both phones can take 4K video, though the XS models can capture at 60 fps compared to 30 fps on the 7. The front-facing camera is also important to note. While both have 7 megapixel f/2.2 lenses, the one in the XS models has a faster sensor and can take 60fps video. It also supports portrait mode, Animoji, and smart HDR. All that said, the cameras in the 7 Plus are quite good. The differences should only be a dealbreaker for photography enthusiasts. While the cost jump to the XS Max is huge, it does at least come with a minimum 64GB of storage compared to the 7’s 32GB. The only other offering for the 7 is 128GB, so if you need a ton of storage, look to the XS for its 256 and 512GB options. The 7 Plus’s A10 Fusion chip, combined with 3GB of RAM, offers excellent performance. 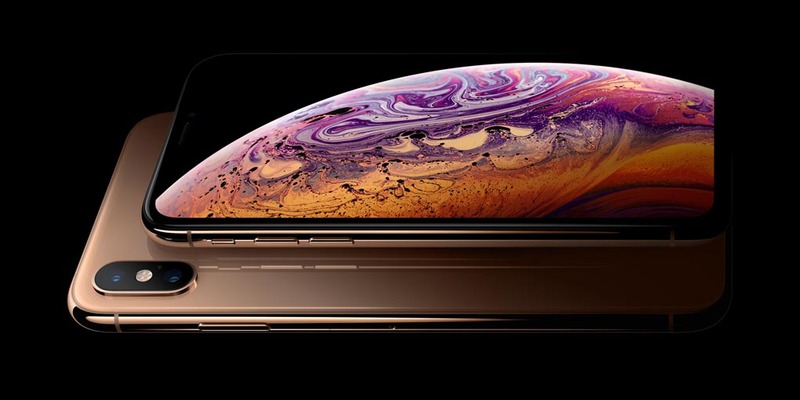 The XS Max’s A12 Bionic chip and rumored 4GB of RAM are a step up, but real-world performance differences will be minimal for most people. Both phones are nearly identical in their outside dimensions – we’re talking fractions of a millimeter separating them. The XS Plus is noticeably heavier, though, at 7.34oz / 208g compared to the 6.63oz / 188g of the 7+. A lot of that has to do with the glass backing of the phone to help wireless charging, and the attractive stainless steel band around the edge of the phone. The 7 Plus, as with a number of models before it, use a home button with Touch ID to unlock the phone. The XS models use the 2nd generation of Face ID, using special cameras and sensors to allow the phone to be unlocked with your face. This frees up room for a larger screen, though a controversial “notch” for the sensors cuts into the display a bit. Most people find Face ID to be quick and intuitive. If you tend to unlock your phone while it’s not right in front of you, the angle of the phone may cause some difficulties. On the flip side, your hands can be dirty, wet, or covered by gloves and your phone can still be unlocked with Face ID. The iPhone 7 models were the first to offer any level of waterproofing – a very welcome addition. The 7 is IP67 certified, which means it’s rated for up to 30 minutes at 1 meter underwater. The XS models up this a bit with IP68 certification, increasing the depth rating to 2 meters for 30 minutes. This improves its chances of surviving a drop into a pool. I consider the larger OLED display to be the biggest improvement in moving to the XS Max, followed by the available storage options and the cameras. There are a bunch of other improvements such as wireless charging, Face ID, and a faster processor. However, these differences are rarely dealbreakers. You can’t go wrong with either phone – both the 7 Plus and XS Max are fast, capable phones that take great photos and offer big displays. Deciding between the two phones largely comes down to just how much the price difference impacts your budget.